Appearance : Adults are 5 to 8 mm long. Their thorax is gray with four longitudinal black lines on the back. The ventral side of the abdomen is gray. The whole body is covered with hair. They have red compound eyes. Females are slightly larger than males. 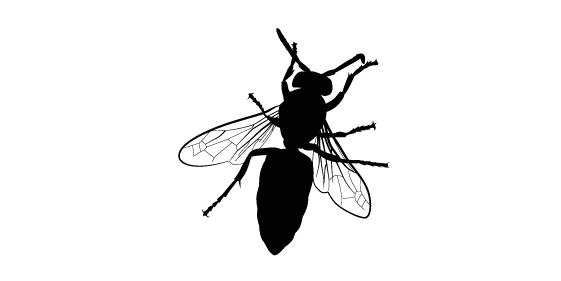 Habits: Housefly is the most common fly species. It bears the household name that it is not a pet, but it’s an insect that comes readily in homes. Nourisment: House flies can only absorb liquid food. They release saliva on solid food for predigest then reabsorb the result of this digestion. They also vomit partially digested material to reabsorb then. Reproduction : Each female can lay up to 500 and even up to 1000 eggs, usually 5 times, each time with a hundred eggs laid. Eggs are white, about 1.2 mm in length. After one day, the larvae (maggots) fare; they live and feed on organic matter (usually dead and badly decomposed path, such as a corpse, litter or feces) on which they were filed. Maggots are pale white, a length of 3 to 9 mm. 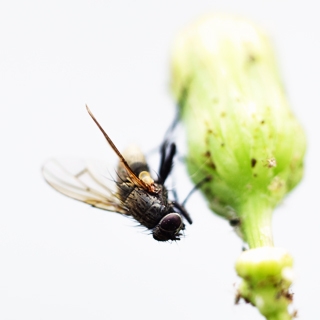 Other: Small flies are not young flies, but they are flies that did not have enough food during their larval stage. Do not wait to be infested! For the extermination of flies, call Groupe AZ Extermination. His professional inspection is free, effective and very fast. Call 514-381-3555 now!